I AM picking handfuls of tomatoes daily, so many I miss some and they fall to rot into the ground, hopefully to sprout next season. Elsewhere in the garden coriander seed has gone in, broccoli seedlings, eggplants have been picked and eaten and more are to come, an olive tree has gone in and I have a spot picked out for a blueberry bush. Lawn has been turned over to a new vegetable and herb plot with comfrey, lemon verbena, lemon thyme and pineapple sage settling into freshly turned and mulched soil. My limbs feel stretched and strong, my face and skin have seen sun, sweat and soil and there have been rewards for my toil. I need summer, sweat and vegie gardening. Ah ditto on the tomatoes... so many here, too many to eat so we've been giving them away & receiving lovely homegrown veggies in return... I love the automatic bartering that growing your own generates. On a sidenote... we've been collecting ours in a strainer too! Wow! You've been busy, I'm impressed. Thanks for your comment, I had a wonderful summer break. Hope you did too! I'm pretty jealous! I went to buy tomatoes in the store the other day (the ground here is frozen solid) and they barely resembled tomatoes. I want summer!! I wish I could be in my vegie garden but it is on the other side of the country as we spend time in Tassie while my partner studies. Oh my favourite yellow pear! I haven't grown them since I lived in teh central desert! Don't know why - now you make me wish I had of! can you post a couple?!! Oh, Katie, how do you juggle a full-time job, feeding the kids, Guides duties and tending what sounds like a massive garden that needs a lot of care and attention?! I think you may be my mothers long lost daughter. I love vegetables and I wish I had the patience and the art of gardening.. so I'll live vicariously through you. Also thank you for your comment on my Milla post, the truth of it cracked me up! Awesome Kate! 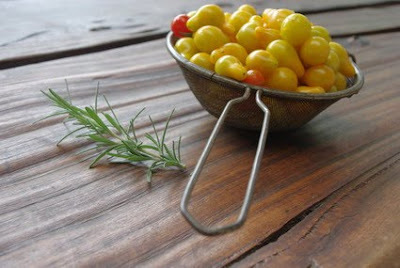 The satifaction and deliciousness of home grow herbs and vegetables - it must be wonderful! Sounds soo good!! What a wonderful summer harvest. My tomatoes are only very just starting to change to a ruby red. Must get them before the birds this time.